Vehicles are more and more based on electric and electronic (E/E) systems that are functionally integrated. The E/E architectures are therefore crucial to achieve performance and functional safety requirements and cost targets. Evolving electronic functionality such as automated driving, connectivity and cyber-security, that will continue to grow as these cutting-edge technologies mature and market acceptance increases, require new electrical/electronic architectures in automotive designs. Implementation of these functionalities in mainstream vehicles will demand a paradigm shift in E/E architectures with respect to in-vehicle communication networks, power networks, connectivity, safety and security. The complexity that goes with these modern automotive architectures is driving the need to collaborate with partners. 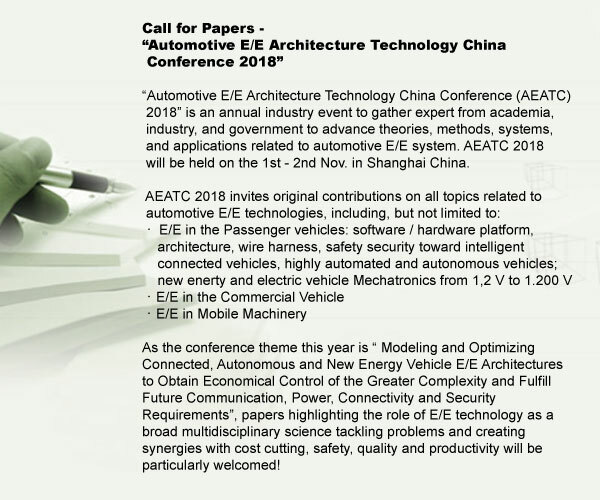 OEMs and suppliers must increasingly rely on partnerships to set automotive industry standards that enable a coordinated approach.The upcoming “Automotive E/E Architecture China Conference ” will gather worldwide leading companies and professionals to discuss the evolution & revolution of automotive E/E architectures and how the industry leading companies envision the technology in the future. This conference will give you solutions on the bottlenecks for current E/E architectures and drivers for their evolution, and provide you with a precious platform to network and buildup profitable and sustainable partnership and achieve future success in the world’s largest automotive market. Worldwide First class speakers with months of marketing research based programme, provide you with international pratical experiences and case studies. A Marriott Luxury & Lifestyle hotel.Located downtown near the famous Yu Garden and Shanghai's Old Town, the Renaissance Shanghai Yu Garden Hotel (Shanghai Yuyuan Wanli Jiudian) is just minutes away from the Bund, Xintiandi and other Shanghai landmarks. Next to the hotel is Yu Garden subway station on Metro Line 10, which runs through the heart of Shanghai. The top-notch facilities at this five-star Shanghai hotel include a business center, four event rooms and banquet halls, as well as a club lounge on the 17th floor with expansive views of the city skyline. In the evening, dine at one of three restaurants serving Japanese, Chinese and international cuisines, or grab a drink at the bar. Guests can exercise in the hotel fitness center or take a swim in the indoor pool and relax at the spa or sauna. summary：Zotye Auto (Chinese: 众泰汽车; pinyin: Zhòngtài Qìchē; officially Zotye International Automobile Trading Co., Ltd.) is a privately owned Chinese automobile manufacturer based in Yongkang, Zhejiang, China. It is owned by Zotye Holding Group and was established in 2005.
summary：SAIC Maxus Automotive Co., Ltd. (Maxus) is a light commercial vehicle manufacturer, a wholly owned subsidiary of SAIC Motor. It was founded in March 2011. Sales to Australia started in 2012 under the original LDV name. Sales also restarted in the UK under the LDV brand. summary：NXP Semiconductors N.V. (NASDAQ: NXPI) enables secure connections and infrastructure for a smarter world, advancing solutions that make lives easier, better, and safer. As the world leader in secure connectivity solutions for embedded applications, NXP is driving innovation in the secure connected vehicle, end-to-end security & privacy and smart connected solutions markets. Built on more than 60 years of combined experience and expertise, the company has over 30,000 employees in more than 30 countries and posted revenue of $9.26 billion in 2017. Find out more at www.nxp.com. summary：Qoros Auto Co., Ltd. is an automotive manufacturing company headquartered in Shanghai, China. Its principal activity is the design, development, production and sale of passenger cars sold under the Qoros marque. The company was established in 2007 as a joint venture between Chery and Israel Corporation. It develops vehicles that are differentiated in their design, safety, and connected services and that exhibit international standards of quality. In December 2017, it ushered in a strategic investor Baoneng Group, who secured a 51 percent stake in Qoros for 6.6 billion RMB. The first production model, the Qoros 3, made its first public appearance at the Geneva Motor Show in March 2013 and went on sale in China in November 2013.
summary：Analog Devices, Inc. (NASDAQ: ADI) http://www.analog.com defines innovation and excellence in signal processing. ADI's analog, mixed-signal, and digital signal processing (DSP) integrated circuits (IC) play a fundamental role in converting, conditioning, and processing real-world phenomena such as light, sound, temperature, motion, and pressure into electrical signals to be used in a wide array of electronic equipment. summary：Shaanxi Automobile Group Co., Ltd. is a Chinese bus and truck manufacturer headquartered in Xi'an, Shaanxi. It employs around 23,000 employees. It manufactures heavy duty trucks, medium-size heavy trucks (both branded as Shacman), buses (chassis) and heavy duty axles for trucks. It utilizes Magna Steyr and MAN SE technologies.Its bus chassis are sold under the Eurostar Bus brand. Shaanxi Automobile Group Co., Ltd. enters into JVA with Rawal Industrial Equipment Pakistan for the local Manufacturing of Trucks ,Prime Mover. summary：Aptiv is a global technology company that develops safer, greener and more connected solutions enabling the future of mobility​. Aptiv grew out of Delphi Automotive, a global automotive parts technology company. After acquiring self-driving startup nuTonomy, Delphi split into two companies: Aptiv and Delphi Technologies. Aptiv is where the company houses its autonomous car efforts, including nuTonomy. It’s also struck partnerships with LiDAR companies LeddarTech, Innoviz, Quanergy, and BMW. The company, which has a history of developing safety systems and powertrains for OEMs, is quickly assembling all the pieces for self-driving tech, from over-the-air software updates to connected cars. summary：GAC R&D, established in 2006, is the technical management division and the pivot R&D system for GAC group, GAC R&D is responsible for GAC‘s strategic planning, implementation of new technology and new products R&D, which is an independently operated branch within authorized scope. The total number of patent applications is 2253, and the invention patent accounts for 30%. Ranked in top 1% in china's state identified enterprise technology centers. To achieve a domestic leading and international advanced automotive R&D institution, be able to compete with international institutions. summary：Continental Automotive Systems (CAS), founded in 1906 by Alfred Teves, a division of the German Continental AG, is a brake and electronics supplier to the automotive industry, supplying systems, components, electronics, lithium-ion batteries and engineering services for vehicle safety, comfort and powertrainperformance. Its sales top €4.6 billion. It comprises two units: Continental Temic — focus is on auto electronics while Continental Teves — a developer and manufacturer of hydraulic and electronic brakes and safety systems, and of stability and chassis control systems and electronic air suspension systems. It supplies lithium ion batteries for the GM E-Flex System of Chevrolet Volt, from A123Systems. CAS' acquisition of the Automotive division of Motorola was completed in July 2006. Continental recently acquired Siemens VDO from Siemens AG. summary：Molex Incorporated is a manufacturer of electronic, electrical and fiber optic interconnection systems. Molex offers over 100,000 products, across a variety of industries: Aerospace & Defense, Automotive, Alternative Energies, Consumer/Home Appliances, Commercial Vehicles, Data/Computing, Industrial Automation, Industrial Electrical, Medical, Scientific, Smartphones and Mobile Devices, Solid State Lighting and Telecoms/Networking. summary：In order to meet the requirements of constructing Asia’s largest laptop production base in Chongqing. Chongqing Municipal Government has put Chongqing-Xinjiang-Europe International Railway into service through further optimization and improvement of the original Eurasian Land Bridge, with the great support of National Ministries and Commissions such as the General Administration of Customs and the Ministry of Railways, the new Eurasian Land Bridge starts from Chongqing Tuanjiecun passes Alashankou, Kazakhstan, Russia, Belarus and Poland, finally arrives Duisburg of Germany covering 11,179 kilometers. summary：Certainly PLK Technologies does not design the Robot TaekwonV, however we do design and develop the eyes of artificially intelligent automobile. PLK Technologies does not make the entire artificially intelligent automobile but do design and develop the camera assembly. Yet, we are proud of designing, manufacturing and distributing the world top notch, state-of-art artificial intelligence camera presently.From now on, we are committed to move forward to world market with our own camera products developed and produced with in house technologies. PLK Technologies is determined to realize a dream of offering the technologies developed by perspiration of PLK employees as the global standards, and further, becoming the world best technologies and products. Through hard work and sweat, we will always follow the dream of becoming Korean Standards and providing the world’s best technologies and products. summary：​Our innovations drove America's move from family farms to agricultural dominance. Then from local economies to the largest economy in the world. Today, wherever innovation drives global markets forward, you'll find us taking the lead. We are Navistar. And this is our drive to deliver. summary：Dongfeng Trucks originated in China, was born in 1969. Trust, professional, deep global technology manufacturing process, and constantly open up the market, to win customer recognition. summary：Suzhou Qingyan Micro Electronic Technology Co., Ltd. was founded in May 2013, is an innovative enterprise focusing on automotive active safety technology and intelligent network technology. The company focused on machine vision, vehicle driving parameters real-time and dynamic analysis, research and application of multifunctional auxiliary driving and intelligent decision-making, information processing and remote monitoring platform for the development of core technology and product development, is committed to the integration of technology and innovation depth, continue to provide quality products and services for users and technology. summary：Beijing in the joint Mdt InfoTech Ltd, for many years focused on two market, in order to operate the vehicle monitoring and management services and operational services, to carry out integrated transport information services. In combination with Hui car networking in the field of professional and mature technology,has won the high-tech enterprises, Chinese satellite navigation industry ten operators, the best car network operators and other annual honors, become the domestic commercial vehicle networking industry leader. summary：For over a decade, Geotab has been a proven industry leader in the area of fleet management and vehicle tracking technology, also known as telematics. Geotab’s advanced telematics is used to manage employee productivity and significantly reduce accidents. Geotab helps manage the maintenance, inventorying and fuel management of the company's fleet vehicles. Geotab data is open and is easily integrated into your IT systems to automate. Many Fortune 500 companies rely on Geotab’s technology to provide measurable management data. Since Geotab provides end-to-end hardware and software solutions that are entirely scalable,both enterprise organizations and small-to-medium sized firms are active users. Geotab is the inventor and manufacturer of the products. These products are represented and sold worldwide through hundreds of partners. With over 100,000 daily users of Geotab software that processes over 600 million data points daily, geotab has established itself as a world leader in helping businesses move forward. summary：Saic-iveco Hongyan Commercial Vehicle Co., Ltd. (hereinafter referred to as the "Shanghai Hongyan") is the world's top 500 enterprises, China largest automobile group Shanghai automobile group Limited by Share Ltd (hereinafter referred to as "SAIC"), and the world's top 500 enterprises of Fiat the group Iveco Commercial Vehicle Co. Ltd., China top 500 enterprises in Chongqing electromechanical holding (Group) company invested in June 15, 2007, with nearly half a century of heavy truck manufacturing experience of Chongqing Hongyan Automobile Co. Ltd was founded on the basis of the earliest China heavy truck joint venture, is also China's first comprehensive introduction of European Vehicle Technology of heavy truck manufacturing enterprises. summary：C.V.Joint Co. Ltd (United truck) is located in Anhui province Wuhu Sanshan Economic Development Zone, as Chinese international shipping container (Group) Limited by Share Ltd (hereinafter referred to as: CIMC) holding company, is a research and development, production, sales, service and spare parts production and integration of large-scale heavy truck enterprises. With the domestic first-class punching welding, painting, assembly, debugging frame, five production lines, the main production equipment, testing equipment have reached the domestic advanced level, the main models include tractor truck,Mixer truck, dump truck, special truck and etc..
summary：Xiamen Jinlong automobile group Limited by Share Ltd was founded in 1988, with the manufacturing and sales of large, medium and light buses as the leading industry, is currently the largest China bus manufacturing group, the world's largest production base of large and medium-sized passenger car. Listed on the Shanghai stock exchange in 1993, is the first listed company in the domestic bus industry (securities code: 600686, securities referred to: golden dragon automobile). As of the end of 2015, the company's total assets of 25 billion 382 million yuan, net assets of 5 billion 973 million yuan. summary：Beiqi Futian Motor Company Limited (hereinafter referred to as the motor car), is a cross regional, cross industry, cross ownership of state-owned listed companies. Headquartered in Changping District, Beijing, the existing assets of nearly about 30000000000 yuan, the brand value of 671.27 billion yuan,the staff of nearly 40 thousand people, in Beijing as a management center, with the vehicle and parts division in Beijing, Tianjin, Hebei, Shandong, Hunan, Hubei, Guangdong, Liaoning,and other 9 provinces, research branches in mainland China, Japan, Germany, China China Taiwan and other countries and regional large enterprise groups. summary：In August 2010, with the Zhejiang Geely Holding Group officially acquired a 100% stake in Volvo automobile, Volvo automobile has become the first Chinese owned by the luxury car brand, Volvo automobile from the Renaissance is a solid guarantee. Volvo car belonging to Geely Holding Group, but the independent operation,in the past three years, Volvo has made significant progress in the vision and strategy, product planning, brand building, supply system training and core management team building etc..
summary：Zhengzhou Yutong Limited by Share Ltd (hereinafter referred to as "Yutong") is a large set of modern manufacturing and sales of passenger car product development, as one of the manufacturing enterprises, Nissan vehicle up to 340 units or more. The main factory is located in Henan province Zhengzhou City Yutong Industrial Park,covers an area of 1700 acres, has a chassis frame body electrophoresis, electrophoresis, spraying robot and other international advanced passenger electrophoretic coating production line,is currently the world's largest single plant scale, the most advanced technology conditions of large and medium-sized passenger car production base. 2012 new energy plant put into operation a total area of more than 2000 acres, the construction area of 600 thousand square meters,with an annual output of 30000 units of production capacity, China's passenger car industry has become the most advanced, the world's largest new energy bus base. summary：​BYD was founded in 1995, respectively, in the Hongkong stock exchange and the Shenzhen stock exchange, mainly engaged in two rechargeable battery business, mobile phones, computer parts and assembly business based IT industry,and includes traditional fuel vehicles and new energy vehicles, the automotive industry, and use its technological advantage to actively develop other new energy products including solar power, energy storage power station, electric forklift, and LED.BYD's existing staff of about 180 thousand people, with a total area of nearly 17 million square meters, has established 22 production bases in the world.